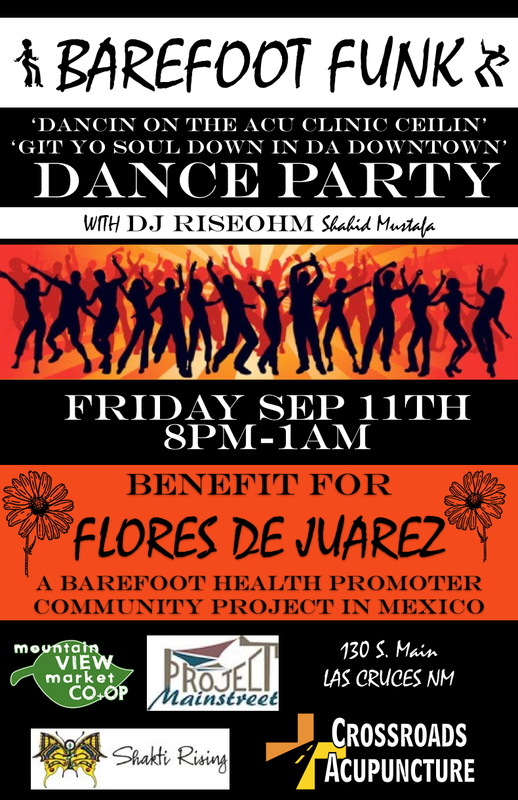 Crossroads will host a fundraiser dance party on Friday September 11th at 8pm 130 S. Main to benefit their project Flores de Juarez. How did you first get involved with acupuncture and what made you want to work in underserved/border town communities? I started out as an addictions counselor at a detox program where group ear acupuncture was a daily therapy for alcoholics and heroin addicts. And as a counselor I had the chance to study in the South Bronx, NY at Lincoln Hospital where activists had developed this model of grassroots, community-based ear acu care. Health workers from anywhere could come to Lincoln to learn it: a standardized ear acupuncture technique as an alternative to drugs, a tool for recovery, and adjunct for community health clinics. One of the students in my class, for example, was a peer HIV counselor from Kenya. The protocol—known as NADA (National Acupuncture Detoxification Association)–is safe and simple, and easily taught to community workers, and has been implemented in a variety of grassroots mental health and humanitarian aid contexts for the past 4 decades. I saw what an effective non-verbal intervention it proved to be, especially for people who struggled with talk-therapy or 12 step groups or pharmaceutical care. And the fact that it can be taught to health promoters and front-line providers makes the service delivery extremely cost-effective. I went on to go to acupuncture school where I had the chance to write for a periodical that focused on researching the use of this protocol. One report I did was on a family clinic in Anthony, NM that was—in 2008—providing ear acupuncture for refugees from Juarez fleeing violence. I returned in 2010 and visited a few different projects within churches in Juarez serving women and marginalized groups in the city, to learn more about the challenges in providing community care. I was invited to do a community acupuncture session for some laid-off maquiladora workers. They were gathering regularly in a small church on the north side of Juarez to do breathing and relaxation and stretching exercises similar to taichi and yoga. They liked the treatment, and asked me when I could come back. I told them that it would be much better if they could learn these techniques themselves. This led to many conversations with church leaders, who were able to organize a training in 2011 for pastoral workers serving in some of the fringe parts of the city. At that time the churches were developing new programs specifically to serve victims of violence. Since then we’ve been invited back to offer several other trainings. What are some of the reasons people seek treatment at Crossroads? What are some common issues? Like most community acupuncture clinics, pain and stress-related problems are the most common reasons why people reach out to us for help. At our Crossroads clinic in Downtown Las Cruces we don’t specialize in any specific type condition or demographic. We offer care in a group setting, using distal points in the hands, head and legs, as is traditional in Asia. So there’s no disrobing necessary, making it more comfortable for most people. The group setting, the “keep your clothes on” environment is essential to making acupuncture palatable for the masses. Community acupuncture strives to treat the largest slice of the population for everyday health conditions, from stress to migraines to sprained shoulders, and everything in between. That said, we do offer care for patients who have diagnosed conditions like depression, anxiety, bipolar disorder, and we’ve helped some come off medications or deal with the side effects of the drugs. We’ve helped people get off their blood pressure meds as well as cigarettes. We provide support for people with chronic conditions such as Parkinson’s, kidney failure, Diabetes, and various autoimmune disorders. As our clinic has grown, a large number of people diagnosed with PTSD and/or who have a history of trauma or domestic violence have come in for care. We had one patient from Juarez who had recently been shot in the head, survived, heard of our clinic and having access to our services several times a week over a month we were able to significantly help increase his neurological functioning. Even though it’s a group setting we treat patients for very sensitive health conditions like menstrual problems as well as prostatitis or even a woman trying to leave an abusive spouse and struggling with trauma and depression. Our students providing free ear acupuncture in the region have reported success in this specific ear protocol in providing support for people going through cancer, pain, anxiety, and depression. Another program in Juarez offers ear acupuncture for homeless people with a history of violence and severe psychiatric illness, and they have reported that the treatment has reduced aggressiveness at the shelter. By no means are these therapies and protocols a cure for all conditions and all people at all times. Acupuncture excels in treating any condition where stress is involved. It’s no secret that stress makes most health conditions and psychiatric illnesses worse. Back pain is made worse by stress. Same with anxiety. Same with asthma, diabetes: all common problems for people in the borderlands, whether they’re a maquiladora worker in Juarez, or a soldier returned from Afghanistan, or a sales clerk at Wal-Mart. Acupuncture helps people calm down, which can help a variety of body organ systems to function better. So it’s no surprise that we’ve found acupuncture to be helpful as an adjunctive component in managing a broad spectrum of health problems worsened by stress. People are extremely resilient with a few supports in their lives and a few safe spaces to take refuge in. Acupuncture can be one of these supports. Community acupuncture can provide one of those spaces. What are some of the biggest problems when it comes to providing accessible healthcare to citizens in low-income communities? For Crossroads, accessibility to healthcare is limited in a few ways that we seek to remedy. The high cost of healthcare, community disempowerment, and lack of sustainability all present problems. Our approach first and foremost has been about making healthcare affordable for everyday people—rich and poor and everyone in between. Healthcare does not have to be expensive to be effective. We have seen this to be true for acupuncture year in, year out. We also work to empower communities with the tools and resources so they can work towards solving their own problems. It would be great if everyone had a doctor, or if more people could afford to go to medical school so more people could have access to a doctor. But that’s not reality, especially here in this region. So we look at what simple, safe, and cost-effective tools we can teach health promoters working within local, community-supported projects. Sustainability is also crucial. Any healthy, accessible system of care has to be sustainable. This is inherently challenging within a humanitarian aid context, when we’re the outsiders coming from a place of privilege and resources, assisting groups that are marginalized and living in poverty. A nun in Juarez told me a story about an outside medical aid group that came in and provided free lab tests and consultations for several months. They also offered some therapies within an impoverished community. People came and got a lot of help from this group. But then the group lost funding and left and now there’s nothing there for these people that the outside workers left behind. There’s very little that has lasted as a result of that project. So we hear stories like this and we ask: What can we learn? How can we go about this in a sustainable way, not a quick fix, band-aid, hit-and-run way? Crossroads’ work has always evolved out of looking at what types development models have proven to last over time, and approaches to serving the underserved that don’t contribute to an unhealthy dependency. We call our model Community Supported Healthcare. We draw from various branches of grassroots acupuncture care including the NADA and the community acupuncture movements. The Guatemalan Acupuncture and Medical Aid Project (GUAMAP) and the Pan African Acupuncture Project are two acupuncture training programs for health promoters working in humanitarian aid contexts, started decades ago and still going today. These groups have offered us a template not only in how to implement acupuncture as a direct intervention in the aftermath of war and epidemics, but they have also proven to be long-standing, sustainable, and continue to offer grassroots care. Another example: We knew of a project in Uganda—MoxAfrica–training health promoters in a Japanese technique called moxa, which has documented astounding outcomes in treating drug-resistant Tuberculosis. We learned from MoxAfrica how we could start something like this in Juarez. A volunteer came to conduct the training, and since then, over the past year and a half, our students have provided thousands of moxa treatments for free. This new tool has increased their skill sets in being able to address some of the common health problems in Mexico for people who lack access to other forms of healthcare. We also look at social medicine models like the Barefoot Doctor model in China and adapted by the World Health Organization. Basically this model of care taught health promoters in Asia and the Americas simple, effective moxa and acupuncture protocols. This is what our new school came out of: Promotores Descalzos. Barefoot Health Promoters. We’ve been fortunate to have groups like GUAMAP and the Pan African Acupuncture Project, and community acupuncturists around the US lend support and mentorship to our project. Their wisdom helps us avoid the pitfalls of a hit-and-run humanitarian aid project. We knew early on that if we—as outsiders—are the ones providing the care then it makes it less sustainable. So we focus on training health promoters already working within low-income communities. The great thing about acupuncture is that it can be very affordable. The cost of acupuncture supplies is extremely cheap when compared to drugs and surgeries and hospitals. The cost of needles for a community acupuncture treatment is less than 50 cents. Moxa: half the cost of needles. How many drugs are that affordable? From a medical perspective, how have citizens in these regions (i.e. Juarez) been affected by the violence? How do the acupuncture treatments help these patients? The violence and these lasting wounds in Juarez, I’ve learned, have deep roots in poverty, destructive policies, and a failure of democracy and justice in Mexico as well as in the US. These issues are intricately connected to killings and massacres and kidnappings. In the grand scheme of things, medical services like acupuncture play a small but important role in healing. If any medical project can be empowering to a community, even better, then that’s one step towards getting to the root of the problems of economic inequality and social injustice. We partner with churches because we’ve seen many people feel safe reaching out for help in their church. The effectiveness of the service delivery, the cultural competence in which these health promoters offer care, happens because they are the ones healing their own people. It’s less about acupuncture and more about their resiliency, their resolve to serve their people week in, week out. At a basic level of responding to violence and preventing violence from escalating, we’ve also seen our students’ efforts to be a humble unassuming facilitator peace-building. In a community setting, they create neutral, nonviolent, nonjudgmental, noninvasive, silent and meditative spaces for healing to happen, for people who have been hurt as well as and sometimes even alongside and sitting next to, those who have hurt others. They have treated people who have experienced forms of violence. For some, in their recovery, the focus may be alleviating anxiety and nightmares. For others, the group setting of our model of care helps victims to feel safe being around other people, preventing isolation, and providing safe space for them to reach out and get help. Many people may not even recognize trauma as an experience. In fact, it’s not even necessary for the person to have insight into trauma or the nature or cause of their emotional pain in order to benefit from acupuncture. The acupuncture provider doesn’t need to know anything that someone has been through in order to help them. The person doesn’t need to disclose anything or be diagnosed with PTSD or admit they’re a victim. They just have to be willing to sit and rest. Some people—even if they don’t like needles– find a great benefit out of just sitting quietly amidst a group of people receiving acupuncture. These groups hold space for people just to “be” without any cost to them to participate. Everyone needs access to activities like this to rest from society, yet connect with community. Acupuncture—specifically this model of community acupuncture–works well as a mental wellness activity particularly in cultures where western talk therapy and psychoanalysis is rejected, inappropriate or inaccessible. In working with people with trauma, these types of cognitive based therapies can be ineffective, especially for recent events. For someone who has had a recent traumatic experience, one priority is to help them get better sleep. If they don’t sleep for a few straight days after an event, then they may—no matter how healthy they are—start to experience psychosis or lose stability. And one of the first things that many people experience with acupuncture is sleeping better. That’s an important first step in the healing process. There are also health problems that predated the violence. Diabetes and tuberculosis have long been two of the top health problems in the border region. The fear and insecurity brought on by violence in Juarez affects access to healthcare for the people with these conditions. We’ve witnessed their volunteer efforts to be a part of alleviating some of the burden of the local the healthcare system. Many of our students report that people in general have a hard time asking for help for any type of condition, and that the violence has made this worse. We work with them to help them figure out how to make it easier to come in for care. One of our students works in a town where 90% of the population has vanished, and few medical services are available. In response, she offers her own free services for those who have no choice but to stay. Can you tell me about the training and outreach programs Crossroads offers in Juarez? How have the people in this region benefitted from these programs? We were able to conduct a qualitative study on patient reports receiving ear acupuncture in Juarez, and were able to see that 89% of patients report a positive experience, and 0% reported any severe negative effects. More importantly, we measure success on the basis of community empowerment. Are they able to carry on their own projects, through the support of their own communities? We’ve trained about 80 Juarez health providers so far. We always train with the goal of empowering them to be able to carry on their own projects, through the support of their own communities. For the 35,000 treatments we’ve tracked since 2011, they have raised their own funds from within their own communities to pay for their own medical supplies. They aren’t dependent on Crossroads in this aspect. This is a success. It’s very important for us that they reflect critically about and problem-solve locally towards self-sufficiency, even if they’re working in a very poor neighborhood. They also offer massage and herbs and other alternative therapies. They’ve told us that the NADA ear acupuncture is now one of the most effective interventions they have for helping people calm down. One student told us before she learned this technique she didn’t know what to do for someone who came to her with really bad anxiety and lots of stress. Now she can apply this simple ear therapy and within minutes the person calms down and even can take a nap for an hour. They leave looking a lot different than when they came in. A lot of our students migrated from other parts of Mexico to Juarez with their families to work in the maquiladoras, and a lot of the people they help are employed in the factories (or used to be until they got laid off). Our new school is inspired by another migrant and factory worker who is credited as the founder of acupuncture in the West: Miriam Lee. Back in the 70’s, she assisted other factory workers in California after she immigrated from China. It’s fitting that we are teaching her techniques and her spirit of service has caught hold among our students. Are there other clinics like Crossroads in the US/Mexico border region that offer healthcare services on a sliding scale? At this time there are no other community acupuncture clinics—that is, affordable full body acupuncture treatments (points in the head, ears, hands and feet) in a group setting– in our specific region other than our Las Cruces downtown clinic at 130 S. Main. Outside of the El Paso/Las Cruces region, there are 3 community acupuncture clinics in Tucson, and some in San Antonio and San Diego as well. We have helped start up and offer ongoing support to other group-based ear acupuncture clinics that offer walk-in free services. These clinics are by donation-only. Anyone can attend these free clinics. There’s one in El Paso at Casa Vida on Saturday afternoons 2pm. There’s one at Community of Hope at St Luke’s Health Clinic in Cruces, Tuesday mornings at 8:30am. Families and Youth, INC in Las Cruces has a syringe exchange program for injection drug users that offers free ear acupuncture as well. We’re hoping to train more harm reduction workers in the coming year, to help increase access for care to people struggling with addiction. Anthony’s Desert Pride High School for at-risk youth has a social worker offering free ear acupuncture. And then throughout the Catholic Diocese of Juarez there are many parishes that offer the ear acupuncture. In the greater border region, ear acupuncture groups are offered for immigrants through GUAMAP in Tucson and women’s recovery programs at Shakti Rising in San Diego. You’ve worked with health promoters in Mexico to help establish free acu clinics. How can others get involved? We’re throwing a Downtown Dance Party with Project Mainstreet and Shakti Rising on September 11, to help raise funds for our school. DJ RiseOhm Shahid Mustafa from MountainView Coop will provide the tunes and the beats. So all you have to do is come and dance to the music and have fun! Also, just by getting acupuncture at our clinic in Las Cruces, you can help. We share a percentage of our surplus revenues as a dividend for our project in Juarez. So patients of Crossroads are making a contribution to people in Mexico getting care, by taking care of themselves. Visit crossroadsacupuncture.com to learn more about our project, where you can find access to acupuncture in the borderlands, or donate and make a tax-deductible contribution through your credit card, or to stay updated on trainings we’ll be offering. Shakti is now teaching at our school in Juarez. They’re another creative, innovative and grassroots project to get involved with. The El Diario report posted late Saturday (Feb 28) reported 29 homicides in Juarez in February. But late Saturday night, a young man was shot to death by a police officer bringing the total to 30. Channel 44 reported 31. These discrepancies have been fairly common over time. El Diario reported 37 homicides in January; Channel 44 reported 36. Three victims in February were women, exactly 10 percent of the total number of people killed. This female to male ratio is also fairly constant when looking at Juarez homicides from 1993 to the present. The Mexicans in Exile organization will hold a press conference Wed Feb 25 at the Offices of Carlos Spector. The group will discuss violence in the Valle de Juarez and the fact that government forces have allowed criminal groups to exercise control over the region and its residents. Since 2009, the population of the Valle de Juarez has been persecuted, displaced, murdered and disappeared and the government has done nothing to stop this violence. The state has systematically ignored complaints presented against criminals in the region. In Mexico, in Chihuahua and in the Valle de Juarez, authorized crime rules. 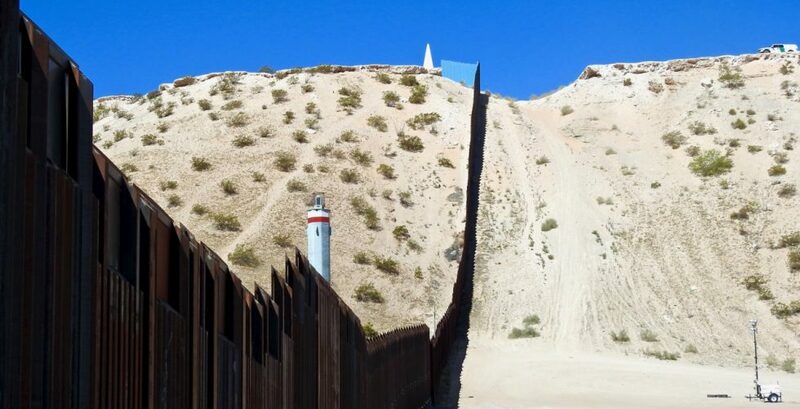 Mexicans living in exile are victims of authorized crimes of the state. Papacho, Toga y Meño: Crimen Autorizado. El Valle de Juárez exige justicia y el arresto de los oficiales que facilitaron los delitos en contra de los ciudadanos de la región. 1430 E Yandell, El Paso, Tx. Este 25 de febrero Mexicanos en Exilio insiste en señalar su posicionamiento ante la violencia y el despojo en México y en el Valle de Juárez, Chihuahua: fue y sigue siendo el Estado. El pasado 18 de febrero la Fiscalía General de la Zona norte presentó, en calidad de detenido, a Mauricio Luna Aguilar a quien se vincula con al menos 20 homicidios en el Valle. Al lado de Mauricio fueron presentados otros integrantes del cártel de Sinaloa: Isidro Soto Aguilar, alias el “pantera” y líder de la célula; Juan Carlos Nuria Gómez, alias el “parral”; Karina Carrillo Griego; Jonathan Arturo Torres Rodríguez, alias el “Jhon”; Antonio Carrillo Griego, alias el “Toño y/o el tio”; y Juan Cuellar Cereceres, alias “Quintana. A estos arrestos se agrega el homicidio de los también integrantes del cártel de Sinaloa Leonardo Rubén Morales Rodríguez, alias “el Toga” y Jesús Manuel Morales Rodríguez, alias “El Meño”. “El Toga” había sido arrestado en 2012 y liberado pocos meses después. Desde 2009 la población del Valle de Juárez ha sido perseguida, despojada, asesinada y desaparecida sin que el gobierno haya hecho nada; sistemáticamente fueron ignoradas las denuncias y quejas presentadas contra estos individuos en las distintas instancias de impartición de justicia ¿De qué otra forma habría sido posible que una sola persona asesinara a 20 personas? En México, en Chihuahua y en el Valle de Juárez impera el crimen autorizado. I’m certain that some will disagree, but since I get asked to talk about the violence in Mexico and I get asked hard questions, I thought I’d share some thoughts on this article from [the] NYTimes. It reports on a new study of lynching in America from reconstruction through the 1950s….nearly 4000 documented cases of lynchings of African Americans–700 more cases than previously recorded. The worst place was Phillips County Ark. where 237 people were lynched in 1919 during the Elaine race riot. The rest of the worst places are in Louisiana…my home state. I am often asked how to explain the extreme violence of the killings in Mexico. The only way I can explain many of these actions–whether they come from directly from the state or from criminal entities sanctioned by the state–is that they are acts of terror designed to control the population. Note the similarity with the Mexican practice of criminalizing all victims of violence (90 percent at least)… Note the similarity to the narrative of the murdered students in Iguala–portraying them as radicals, criminals and hooligans in order to justify their murders. The idea that the people killed in Mexico are all narcos or malandros and thus deserving of their violent deaths. At least 7 people have been killed in violent incidents in Juarez so far this weekend. On Saturday a municipal policeman was shot but survived the attack and injured the shooter. The policeman was taken to the hospital. Later on Saturday, near midnight, 5 people were killed and at least 4 others were injured when an “armed comando” attacked a house party in the Colonia Felipe Angeles. The report says at least 30 people were at the party–a birthday celebration–and included women and children. The attackers also set fire to several vehicles on the property. The owner of the house ran a tortilleria. In another area of the city known as Granjero, a couple were attacked and the man was killed. The woman apparently survived. People in the area indicated that in the past several days there have been several execution-style murders and the residents are fearful. For those who believe that the violence is diminishing in Mexico… Consider the fact that we have no idea how (or IF) the mass killings happening now along the border in Tamaulipas or these mass graves in Guerrero even get into the official statistics. More details below from Animal Politico.